For other appearances or other robots by this name, see Mecha Sonic. 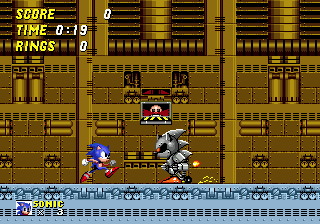 Mecha Sonic is the penultimate boss of 16-bit Sonic 2, appearing almost the moment Sonic steps into Death Egg Zone. A very difficult opponent in its own right, Mecha Sonic directly precedes the game's final battle against his creator Doctor Robotnik. Rocket-boosting across the ground, sliding to turn around, and then coming back to his starting point. Curling up into a ball and rolling across the screen (similar to Sonic's Spin Dash). If the fight progresses for long enough, Mecha Sonic starts shooting out needles during his jumps. The pattern the boss uses these attacks in is the exact same every time it is fought. Robotnik watches the battle through a TV screen in the center of the arena, grinning maniacally throughout. Once Mecha Sonic is defeated, Sonic chases the (surprisingly fast) man until he leaps into the game's last boss, Dr. Robotnik's Giant Mech.